Linda Widstrand is a Worcester area artist whose work has achieved critical acclaim in many fine art exhibitions throughout New England. During high school, her direction in life became clear with the inspirational mentoring of her high school art teacher. Upon graduating high school, Linda received an art scholarship and started taking several art classes at the DeCordova Museum School and at the Art Institute in Boston. Ms. Widstrand continued on to Massachusetts College of Art, where she graduated with a BFA in Painting in 1992. She received honors in Drawing and Collage. Linda resided in Sudbury, MA before moving to Lunenburg in 1989, where her current studio is in her home. At this time, her work is inspired by meditations on life which she conveys in abstract images. Linda has expanded her art experience by creating woven art on a 40” Schacht loom. This has further influenced her innate sense of composition and color, which comes through in her paintings. She uses mixed media consisting of encaustic wax, oil, acrylic paints and an assortment of added objects to create her work. The surfaces of her work also have a wonderful sculptural quality to them, as she paints with an impasto style. The use of many layers of mixed media and paint, create delightful passages into worlds for the viewer to explore. In addition to creating her own work, Ms. Widstrand has taught painting and drawing in her studio and in the local art museum, library and elementary school. Also she has taught encaustic painting at Sharon Arts School in Sharon, NH and at Dabblers in West Concord, MA. She has received numerous awards in juried exhibitions and she is currently a member of Central Massachusetts Chapter and NH Chapter of Women’s Caucus for Art here. For the past few years the Fitchburg Art Museum has invited her to serve on the F.A.M. Auction Committee. 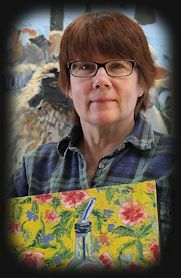 Sharon Arts Center in Peterborough, NH has represented Linda Widstrand since 2003, where she has sold a multitude of paintings. In the spring of 2005, Linda was asked by the principal of the new Lunenburg Primary School to design and coordinate the creation and installation of a tile mural, using the artwork of 402 students and a 66 member staff. Ms. Widstrand initiated and researched all the materials needed and assembled a committee to assist her. The mural was installed in the beginning of 2006. Please see the Mural Page for more information. In December 2005, Linda’s work was chosen for the DeCordova’s Corporate Program. In January 2006, she was selected as one of the four jurors for Mass Art’s All School Show. Also, Mass Art selected Linda’s work for their 17th Annual Benefit Art Auction, 2006and in 2001, participated in the 2001 MCA Alumni drive "Healing Ceilings" and painted two 2 ft. x 2 ft. ceiling tiles for the Children's Oncology Department at Massachusetts General Hospital, Boston, MA.